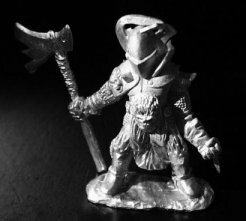 Ilyiad are a new French company producing miniatures and games...and they're fantastic! Their 'Serviteurs de Balor' range may only contain three figures so far, but they've single-handedly reawakened the chaos general inside certain frothers. Sub-titled L'Ordre des Chevaliers Démons (roughly speaking, the Order of Demon Knights), these hulking figures are highly detailed, well posed and full of character. Armaments vary - The Demon Knight champion carries a fascinating form of halberd, the Demon Warlock has his sword held forward, about to unleash a demonic blast, while the 'standard' knight swings a two handed axe - as do the specific insignia and design. Few figures are so exquisite, chaotic and full of corrupted prowess. They are, however, about 5cm in height...no sneaking these onto the battlefield. If you find the Demon Knights too demonic, you can always turn to the Imperial Inquisition (Inquisition Impériale) from L'empire Gothique. 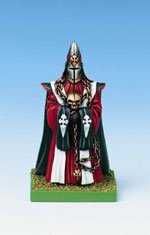 As we all know, the Inquisition were a bunch of sadists and Ilyiad have blended plate armour with robes and Ku Klux Klan stylings to create their religious mentalists. It's an easy and effective look, underpinning the obviously martial elements of full armour with religious and racial hate. 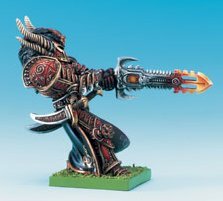 If you like your Chaos Knights to be devoted to evil, as opposed to just liking a ruck, these seven are for you. Most are character models, with three obvious leaders (one armed with an iconic axe, one swathed in yet more cloth and another simply watching), a traditional standard bearer, an excellent musician, one using a crossbow/pavise and just one normal knight. The figures are cast in a slightly sturdier resin than that used by Fenryll and are, if anything, even crisper; the bases are square and easily changed. This is certainly a company to watch closely. 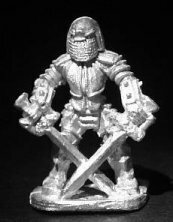 Lance and Laser produce basically sculpted, moderately cast pewter figures for reasonable prices: they're not blazing a trail in the miniature world, but they do make interesting models and support them with rules. For 'Warchest', there are three Hykolaran knights: the Starshield Knight, Imperial Knight and Florentine Knight. All three are on foot and encased in suitable armour: bulky plate with studs and pointy bits but, crucially, the effect is very understated (no chopping your hands off on your shoulder pads here.) The first two carry a sword and shield while the Florentine Knight bears two swords. All are moulded onto circular bases. 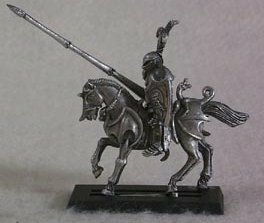 Lance and Laser's Pendragon line carries four armoured knights on horse and, while most are overtly historical (04015 looks like he's ridden out of an Osprey book) the occasional spiked crest or impossibly tiny eyeslit lends itself to the imagination. Grim Reaper produce the Nasteez line, a collection of creatures so horrible they're spelt with two e's and a z. They only have one explicitly named chaos knight, but he's perfect in every way: big armour, brusque look, spikes and a scorpion's tail for that hint of mutation. 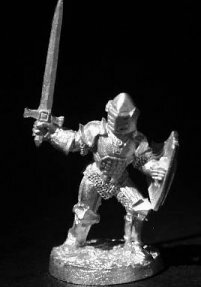 He's also 40mm high, which won't be a problem when you've seen the rest of their range. 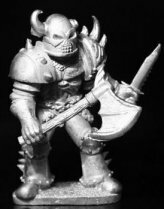 They also have a Chaos Giant, 60mm of solid armour with that chaos classic, a skull shaped helmet. Anyone swiftly browsing the Grim Reaper text catalogue might register only two uses of chaos and move on, but the 'Hellfire' warriors are a hidden gem for those who like it large: eight heavy foot, all between 35 and 45mm high, wearing an assortment of studded or spiked armour and bearing axes, hammers, hooked swords and other wicked toys (plus a bow). 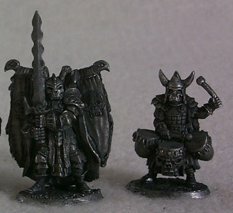 There's no cohesive style about this group, but with a standard bearer and lord they're a ready made warband; even if you dislike a few, and the Hellfire Warrior with Mace doesn't work for me, there are plenty left. 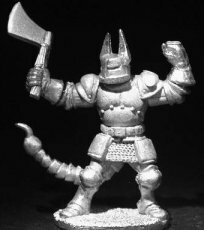 Oh, and they'll all be much bigger than your opponents 28mm humans... The central image in each trio of photos is a giant. Finally, there's the Hellfire Giantess with Sword (not to be confused the Hellfire Giantess, who is still large but, at 40mm, no bigger than the others) and Hellfire Giant with Axe, a nice husband and wife combination. Of course, jealous opponents might ban them! 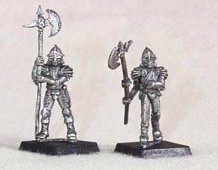 When Wizards of the Coast replaced their promising Chainmail line with a set of cracker ornaments, the miniature world groaned as one...although second hand dealers probably cheered. 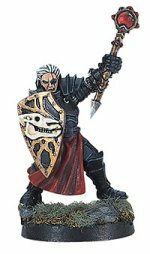 Anyway, while Chainmail's Human Shadow Priest fails to convince as a priest, his thick armour plate, morbid shield design and patched eye are perfect for a human chaos champion, while the globed weapon is suitably odd. Of course, you could always snip the head off and add something bestial! 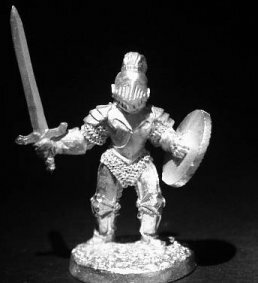 All Chainmail figures are slotta-based, lead and slightly smaller than modern 28mm. 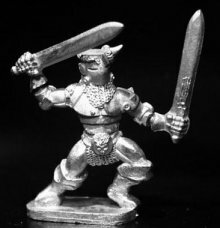 Ral Partha were the Atari of the miniatures world, the early trailblazers who rose high and fell far. 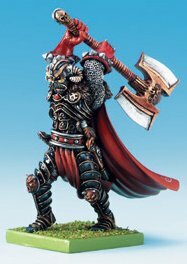 Nowadays, Ral Partha Europe and Iron Wind Metals (USA) carry on the greatest lineage in froth, making plenty of old figures available. 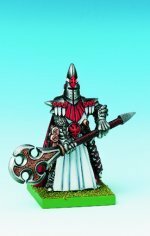 Their chaos content is divided amongst three lines: the Principate and Legion sections of their Crucible range, and the Chaos Imperium figures in Fantasy Armies...and they're great! The Principate are thinner and more athletic than your average Chaos Knight, perfect alternatives to the lumbering warriors of other companies. Take your choice from two Bloodguard Pikemen, two Bloodguard Halberdiers, a Champion, a Mounted Knight and the Duke (whose ramage rather damages his chaos credentials: it's a big bird). All wear a light looking plate, with the emphasis on curves and points rather than chunks of steel. The Duke is covered in silly spikes (still no excuse for the bird). 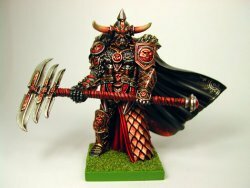 The 'Thane's Bodyguards' could also be used as Chaos Knights, if you trade off the visible faces for skull armour and huge axes (or is that trade off the axes against the skulls...), while one of the 'Thane's Barbarian' two pack also fits. The other is a true barbarian! The Crucible Legion's Void Dweller and Void hunters are less martial, instead evoking constantly moving warbands. 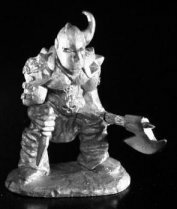 The Dwellers are less armoured, but with horns, big axes and eye patches the feeling of chaos, if not evil, is maintained. But back to chaos knights. 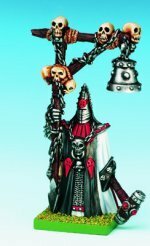 As you might expect from an army called 'The Chaos Imperium', most of their figures can be fielded as knights of chaos. The chaos guardsmen and chaos command combine to make a good looking, varied unit dressed: they're shabby, multi-layered and wielding wickedly spiked shields: no comedy prongs here. However, the musician does look orcish and the general/hero has the most over the top cloak in this (or any other?) showcase. 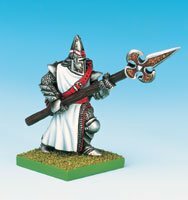 You can bulk the numbers up with Chaos Footknights - three troops with hand weapons and light armour - and the Shock Troops, who carry barbed spears. 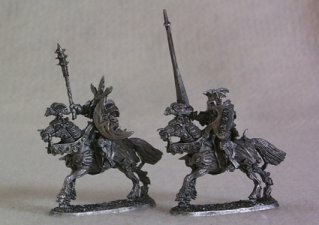 Unlike many of the companies listed here, Ral Partha also provide decent numbers of mounted chaos knights (and to many, that's what real knights should be). 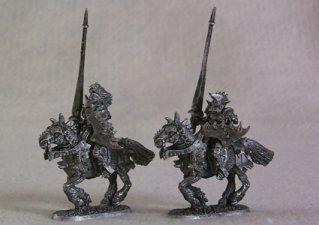 There are 2 types of Chaos Heavy Cavalry - well armoured, well designed and tough - 2 types of Death Knight Lancers - as the Heavy Cavalry but with more spikes and razored edges - and the Chaos Mounted Knights, who look like the Heavy Cavalry after being put through a super-chaos makeover. All are mounted on horses armoured like Tiger tanks. The Fantasy Armies range are moulded onto varying sizes of lead base, but the Crucible figures are slotta and easy to rebase; all are 28mm. 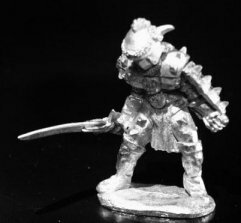 Sculpting is generally good, as is casting, and the price is fair: aspiring Chaos generals could do far worse than simply recruiting wholesale from the 'Partha. A figure called Raum, the Destroyer of Cities had better be damned impressive, and when it's in a 'masterpiece range', doubly so. Luckily, this figure is absolutely superb: great detail, impressive shape, solid casting. Unfortunately, it's 18.5 cm tall, which is roughly six normal chaos knights stacked up. It also costs �60. 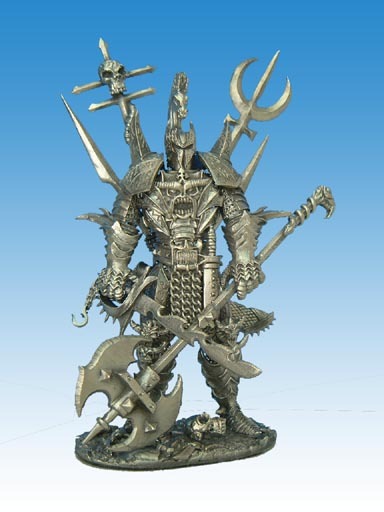 If you want a towering chaos giant, you'll find no better figure, but Raum is probably best considered a display piece. In addition, some people find him too 'busy', especially the numerous flag poles and other impedimenta on his back. If you've got the money and the opponents (ideally, someone who wants to field a horde of dinosaurs) then put in some over-time in!